An electric acoustic bass guitar with the popular violin shape body. Has built-in G tuner, distortion booster, treble and bass boosters. Has an all new fast and easy to fret neck, with double T-Bar and adjustable truss rod. Has two exclusive Vox Ferro-Sonic high output wide range pickups. Fully adjustable bridge. One volume, two tone controls, 3-position pickup selector switch. Has jumbo chrome plated machine heads. 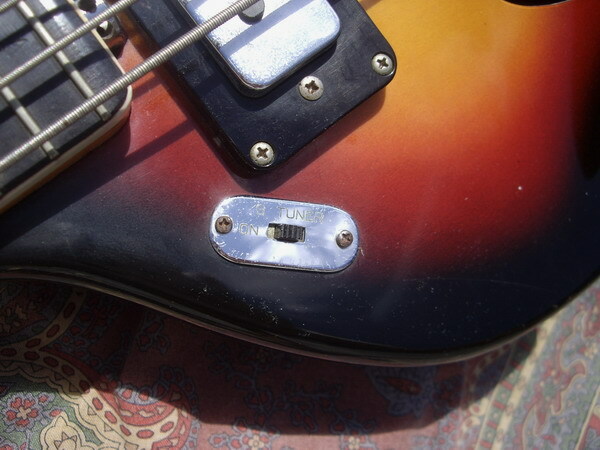 Bass is all original some very little ding and as normal in the original polyester vox some lines in the paint. 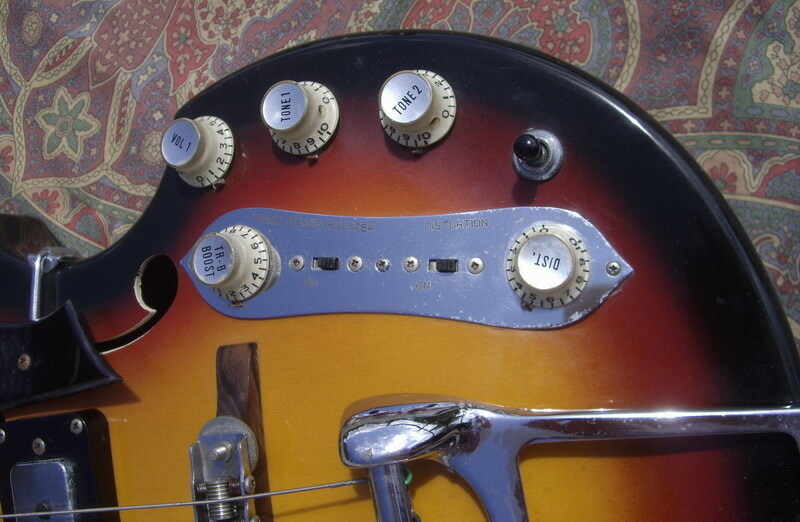 The original pickguard taken in a wavy but totally intact shape. All circuit working, straight nek with good frets. The built-in effects include a G tuner, treble/bass booster, and "distortion" which is a very cool fuzz effect powered by the BC 108 transistor which was used in the original Dallas Aribter Fuzz Face pedals. This 13 inch wide, 1 7/8 inches deep, laminated maple hollow body 'violin-shaped' bass weighs just 7.40 lbs. The body is a rich three-tone sunburst and features two specific 'f' sound-holes with edges painted white. The three-piece maple neck with two mahogany center strips is bolted to the body with four screws and has a single-bound rosewood fretboard with a short-scale length of 29.50 inches, a metal nut, zero fret, 21 original medium-thin frets and pearloid dot position markers. The nut width is an amazingly thin 1.41 inches and the neck profile goes from 0.83 inches at the first fret to 0.91 at the 12th fret. The face of the headstock with "VOX" gold metal logo. On the back of the headstock is a black decal with "Made in Italy by Vox". 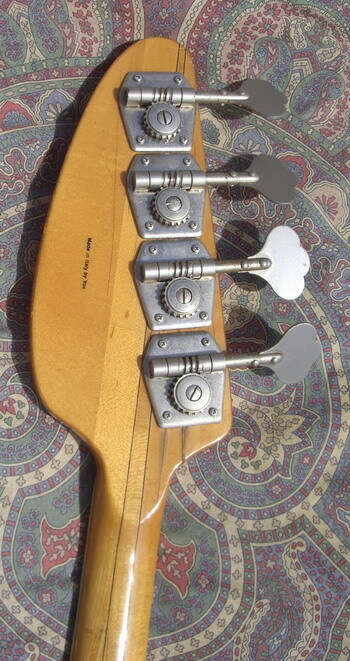 Four individual Kluson style bass tuners with cloverleaf buttons as used on Fender basses of the sixties. 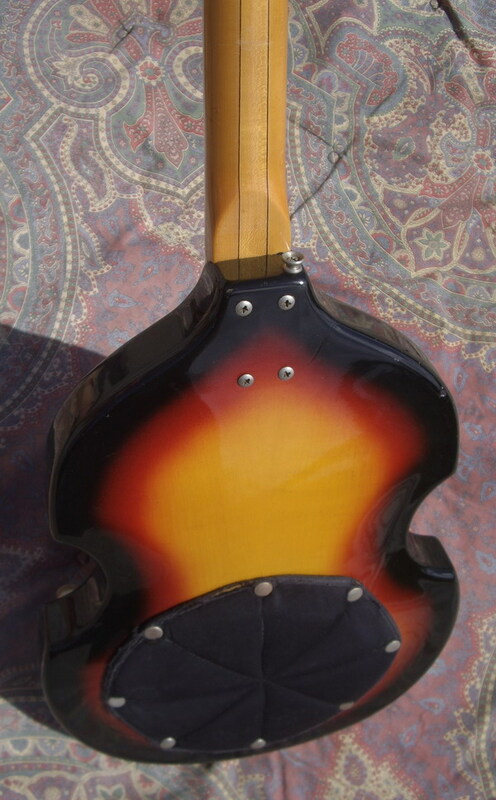 Two 'Butterfly' string-trees with metal spacers.Specific shaped tortoiseshell plastic pickguard with tortoise plastic finger-rest (secured by three screws). Two Vox Ferro-Sonic single-coil bass pickups, each with four pole-pieces with black plastic surrounds.Five controls, one volume, two tone, treble/bass booster, distortion booster + three-way pickup selector switch, on-off treble/bass boost switch, on-off distortion booster switch and on-off 'G' tuner switch. The treble/bass booster control, the distortion control and their respective on/off slider switches all on a specific shaped metal plate. The other controls are fitted directly to the treble side of the top. The Master volume is a 'telecaster style' knob with knurled edges and slightly domed top and the others are clear plastic over white bell-shaped knobs with metal tops. Specific individually adjustable four 'ridged' saddles on height adjustable rosewood base and specific Vox tailpiece with ebony insert with "VOX" in raised gold metal letters, secured to edge of body by three screws. 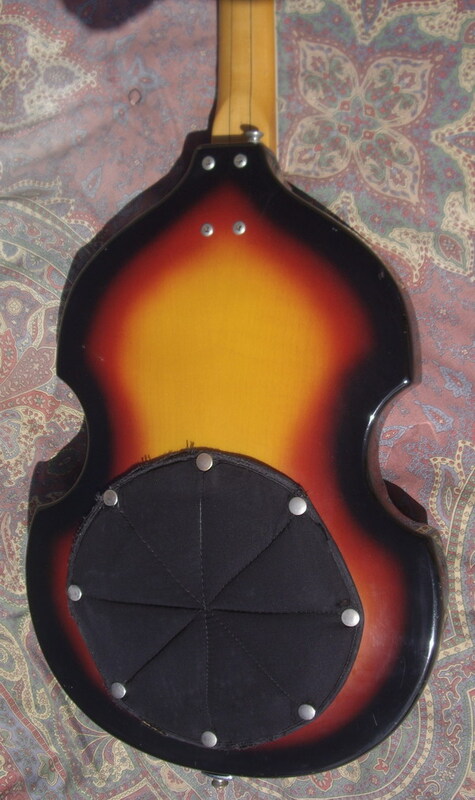 Original black padded protector pad on back of guitar with eight fasteners. The Vox Astro IV Bass was offered in the 1967 "Vox, It's Whats Happening" and the 1968 "The Sound That Travels With the Stars" catalogs. This bass featured a number of onboard battery operated special effects. 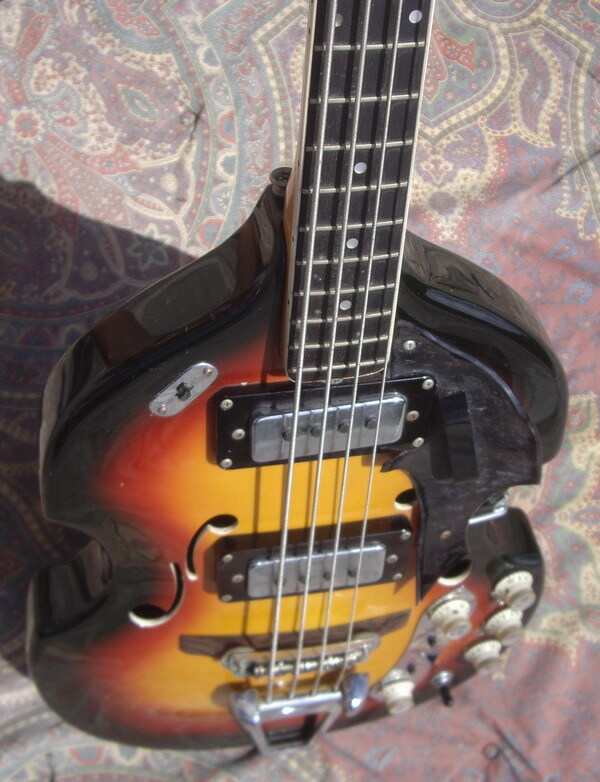 The styling of the Vox Astro IV was obviously inspired by the Hofner Beatle Bass, popularized by Paul McCartney of the Beatles. The 1968 US Vox catalog described the Astro IV bass as follows: "An electric acoustic bass guitar with the popular violin shape body. Has built in G tuner, distortion booster, treble and bass booster. All new easy-to-fret fast-neck with the Vox double T-bar and adjustable steel rod. Has two exclusive VOX Ferro-Sonic pickups. Fully adjustable bridge. One volume, two tone controls, 3-position pickup selector switch. Has jumbo chrome plated machine heads. Sunburst, Cherry, or Sandburst." 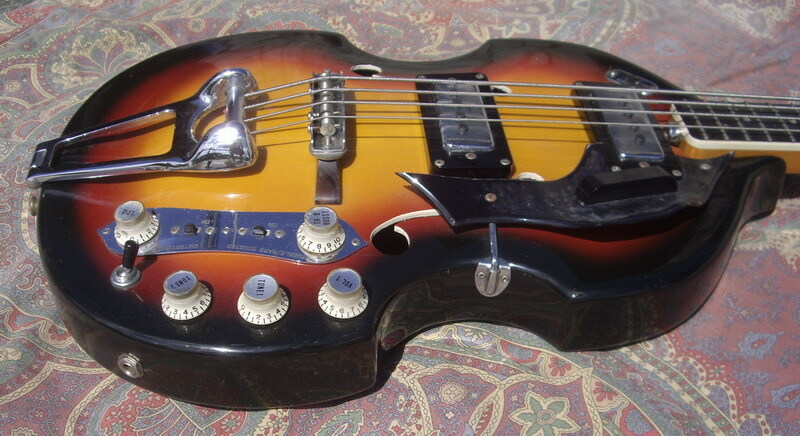 The 1968 US Vox price list indicated that the retail price of the Astro IV was $395 USD. 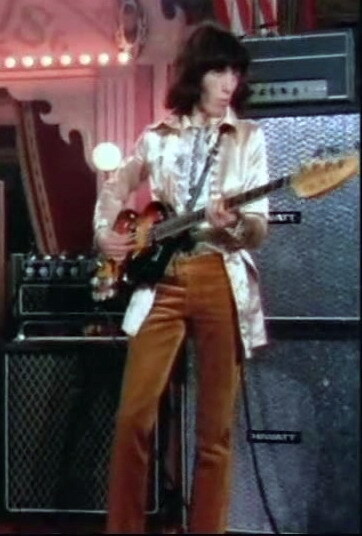 This is the same type of model of VOX electric bass that you see in the hands of "Bill Wyman" in "The Rolling Stones Rock and Roll Circus" filmed in December 1968. 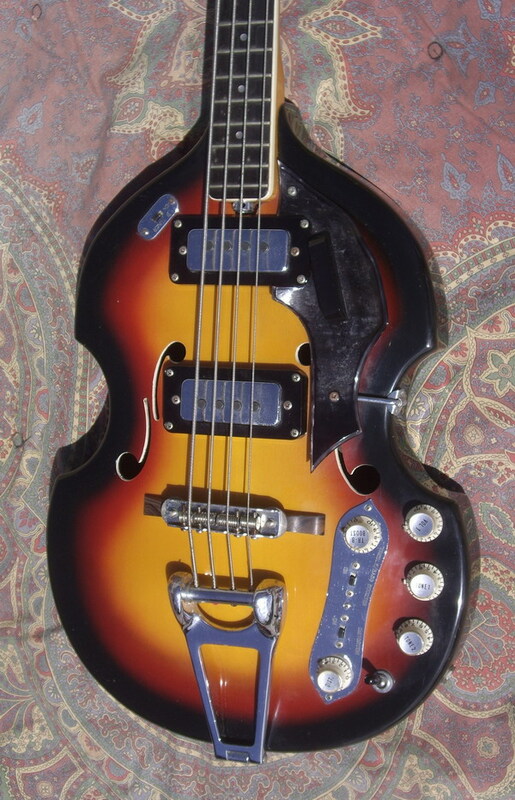 "Bill Wyman" used various basses during the Sixties, including a teardrop-shaped Vox that was actually billed as the "Wyman Model", but he had one of these, too. 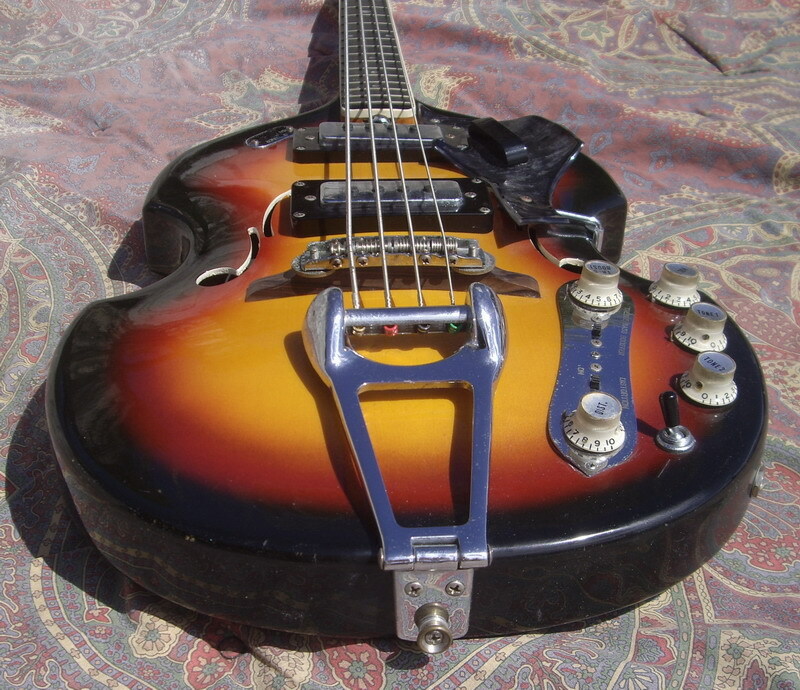 "Bill Wyman" used a "Vox Astro IV V273" violin Bass for some of the "Beggars Banquet" and "Let It Bleed" sessions.